Click image to view a larger picture. 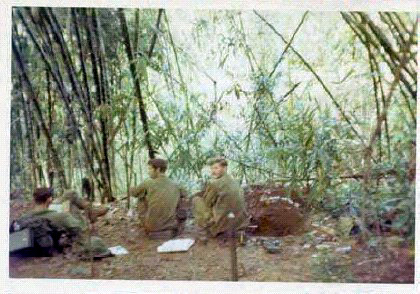 This is the only Photo I thought I had from Vietnam (see below I found more in an old scrapbook I had forgotten I had!) It was taken in a rubber plantation just outside of Quan Loi. I am on the Right side with the radio on my back. The other guy is John T. Johnston nicknamed TJ and he was from Rhode Island. Imagine my surprise when out of the blue John Butler sends this picture! That is me sitting, facing the camera! I can remember the guy sitting to my left however his name escapes me. 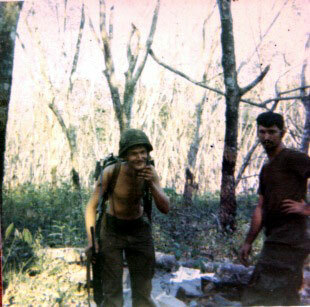 I have been very fortunate to find other guys from D 1/8 that had pictures. I have broken them into individual collections. Click on the links below to view these collections. way to many to list! New Photos I just found!